The title of my column comes from a recent op-ed penned by Dr. David Shulkin, a day after he was unceremoniously fired as Secretary of the Department of Veterans Affairs. This piece is not intended to focus on Dr. Shulkin’s comment in the context of his op-ed. I am seeking answers to questions I think many of us share. 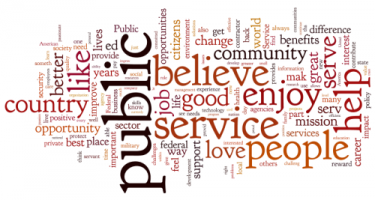 A 1996 article in the Journal of Public Administration Research and Theory describes several elements by which public service motivation can be conceptualized, which are: attraction to public policymaking; commitment to the public interest; civic duty; social justice; self-sacrifice; and compassion. One or more of these elements is almost certainly what drives dedicated people into military service, law enforcement, public education and other federal/state/local employment. But can they maintain this motivation, given the current hostile atmosphere in which many public servants must now function? Federal employees might share Dr. Shulkin’s sentiment that it should not be this hard to serve their country. Since the beginning of the year, the federal government has twice been shut down. Although each shutdown was brief, I know firsthand the anxiety and frustration many federal employees felt before, during and after each one occurred. Also, some federal agencies have seen frequent changes in leadership within the current administration, while other federal agencies still have no current leadership. In a recent article in FEDWeek, Partnership for Public Service President Max Stier noted, “Vacancies also create ripple effects that can cause stress on the agency. When leadership positions are vacant, employees may feel uncertainty about the future direction of their agency.” Although 91 percent of respondents in the 2017 Federal Employee Viewpoint Survey felt the work they do is important, one has to wonder if their motivation to continue their important work has been compromised. Federal, state and local law enforcement officers may also be thinking that it should not be this hard to serve their country (or state, or county, etc.). The current national dialogue related to law enforcement seems to follow one of two conversational avenues. One discussion concerns the Federal Bureau of Investigation and the politically based debate regarding public trust. The other discussion concerns the treatment of minority citizens by police. In both instances, there are strong emotions—both positive and negative—from the public and elected officials. I elect to refrain from providing any personal perspective on these two national discussions, as my purpose is only to identify what is taking place right now for those in law enforcement. As there seems to be little progress toward resolution to either of these dilemmas, how might that affect those law enforcement agents and officers who were motivated by self-sacrifice, social justice or civic duty? Those working in the education field have also gained national attention recently, perhaps prompting those in that sector to also think it should not be hard to serve their local jurisdictions. Educators across the country currently are fighting for better pay and other benefits. West Virginia teachers went on strike for almost two weeks, effectively shutting down the state’s education system until Governor James Justice signed a bill into law providing a 5 percent salary increase. Oklahoma and Kentucky educators are following suit with plans to strike over salary and pension concerns. At some point, many of these educators were driven by compassion, civic duty or other element of public service motivation to work with America’s youth. Is that motivation still there, regardless of their willingness to go on strike? And what about those contemplating working in the public sector? Do the current political and social climates affect possible public service motivation for them? Based on recent events have forced adolescents to be leaders while our leaders sometimes act like adolescents. These brave, dynamic young people are showing the world their spirit. Will their thirst for social justice, commitment to the public interest or compassion turn them toward or away from public service? Are we evolving into a nation in which “it should not be this hard to serve your country” becomes the new normal for all those working in the public sector? I have no answers for the questions I’ve posed throughout this writing. I offer them only as food for thought, although maybe a reader or two can provide brilliant insights. Until then, perhaps leaders in public administration can reflect upon these possible challenges in public service motivation. Are the actions of these leaders – elected, appointed or other capacity – helping or hindering their employees embrace their commitment to public service? Author: Carmen Ashley is a doctoral student at Valdosta State University and is also a federal employee who comes from a family dedicated to public service (military, law enforcement, education). Her email is [email protected], and her Twitter handle is @CarmenLAshley.